Menorca is the wildest of the Balearic Islands, one where nature reigns and human activities are integrated almost seamlessly with postcard landscapes. It is not difficult therefore, to understand why Menorca is a Biosphere Reserve. A UNESCO Biosphere Reserve is an area where man's role is crucial in the sustainable transformation of the landscape. This is not virgin countryside. Here, man and nature live side by side, harmoniously and responsibly. Why is Menorca a Biosphere Reserve? Minorca was declared a UNESCO Biosphere Reserve on 8th October 1993 because of the need to preserve the great diversity of habitats that coexist on this small island - the richness of flora and fauna, the quality of the rural landscape and archaeological heritage. The island of Menorca is less than 50km long and 22km wide, but we can find beaches, valleys, caves, wetlands, sand dunes, hills, ponds and streams. Stay in a villa in Menorca and discover this unique island. The Albufera Natural Park des Grau is the core of the Biosphere Reserve. Created in 1995 and later expanded in 2003, the park occupies the northwestern part of the island - the lagoon area, a stretch of coastline from Es Grau to Favàritx, the Isle of Colombo and the marine reserve area - and is also the major wetland area on Menorca, lying a few kilometers from Mahon, the island's capital. Initially, the park was an area of swamp and marshland, ideal for hunting and fishing. With the arrival of tourism in the 1970s, a project was begun to transform the Albufera into a tourist urbanisation, complete with a marina, paths and a golf course, but luckily the project was cancelled by a local environmental movement. The Albufera is considered one of the three most important wetlands in the Balearic Islands for scenic and biological interest. Here you can find up to 90 different species of birds (that rest here during migration, or take refuge in the winter), native Mediterranean plants and both fresh and saltwater fish and shellfish. The best way to explore the park is to take one of three routes: the blue route, which goes through the Es Grau Beach area, the wetland and the forest. The green route, perfect for watching waterfowl and the red route, which offers the best panoramic views of the lagoon. You can find maps and information about the routes in the entrance of the Centro de Recepción Rodríguez Femenias. The centre also offers guided tours and activities all year round, as well as a permanent exhibition which is situated in the park. Inside the park, the best areas to visit are definitely the Bassa de Morella which is right next to Cala Tortuga, the salt flats of Addaia and Mongofre (now disused), Es Grau Beach and the point of Favàritx with its lunar landscape and rich slate, devoid of vegetation. The island of Menorca, from a geological point of view, is divided neatly into two halves by an imaginary line that runs along the Carretera General (the island's main road) from the port of Mahon to Cala Morell. To the north of the island is the area of the Tramontana, a mosaic of ancient land which is predominantly rocky and uneven. To the south of the island is the Migjorn Gran area, a limestone shelf dotted with caves and furrowed by ravines and valleys carved by streams, which meet on the beaches. The most interesting and beautiful of these is the Barranco de Algendar, which flows to Cala Galdana. The geology of the island is reflected in its beaches, each very different depending on the area. Menorca boasts 131 beaches, more than those of Mallorca, Ibiza and Formentera put together. The beaches on the south coast are white sandy coves with crystal clear waters - reminiscent of the Caribbean - and are surrounded by pine trees; while to the north you will find rocky beaches of pebble or sand, where vegetation is sparse and the land is subject to the Tramontana wind. The presence of sea grass - an essential marine plant for the creation and preservation of the sand - protects the beaches and keeps the water transparent. As a result, snorkeling is one of the best ways for visitors to explore the waters and see the variety of aquatic species for themselves, especially in the marine reserve area. Other ways to enjoy the water include excursions and boat rentals, diving, windsurfing, kayaking, water skiing and sailing. Menorca is perfect for walkers, especially in spring and autumn and there are a number of walking paths open for exploring the island. The most famous and popular walking route is the Camí de Cavalls (GR 223), which is a 185km track running along the perimeter of the island. This old path was created in 1330 as a riding path for military purposes, to defend the island's borders and protect the coasts. 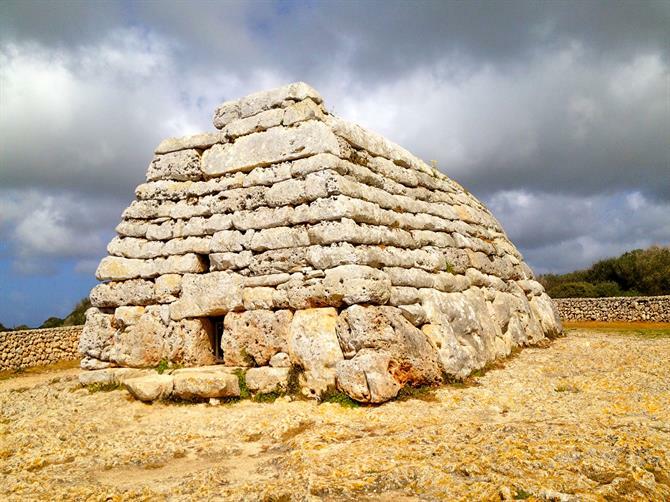 In 2010 it was recovered and today it is the best way to discover the landscapes of Menorca. The path is divided into 20 stages, each between 5km and 10km in length. It is well signposted throughout and each stage has a map at the beginning and wooden stakes every 50-100 metres. Basically, it´s impossible to get lost. Other exploration possibilities are the six cycling routes, which were created by adapting existing rural roads for bicycles and horse-riding tours are also available. In just 700 km² of land, Menorca offers more than 1,500 archaeological sites from different prehistoric eras, dating back to the 2100 BC arrival of the Romans. These sites include treasures such as The Navetas - tombs shaped like inverted ships (the most famous is the Naveta des Tudons, in the town of Ciutadella), The Talaiots - cone-shaped towers and constructions, believed to have had defensive purposes, possibly strategic lookout points and lastly, The Taulas - stonehenge-like sanctuaries believed to be used for religious or astronomical purposes. Do not miss the prehistoric village of Trepucó or the funeral caves at the necropolis of Cala Morell and Cales Coves. We can also find evidence of the presence of the Romans at the Puerto de Sanitja not far from Cala Cavalleria and early Christian basilicas such as Son Bou. Evidence of the Islamic period can be found at the Castillo de Sant Àgueda near Ferreries. All these monuments can be easily reached by car and a good pair of walking boots. If you are thinking about visiting Menorca this year and would like to find out more about this beautiful and fascinating island, read our article about five fantastic things to see and do in Menorca. Or, if you are travelling with children, take a look at our article about Menorca´s breathtaking and child-friendly beaches.